Secrets run deep and dark in this final installment in the Island series. Leia and Walt are on their way to the Other Side, where the legendary land of Cornwall awaits them. Tony, their new friend, has told them that all wars of the past have been forgotten and the citizens of Bodmin and Dartmoor live in peace. People adhere to the tenets of an old religion that preaches forgiveness and non-violence. However, Walt and Leia soon discover that even a peace-loving, ideal society like this one may have its flaws. While on a forbidden trip to Exeter, the old city of their ancestors, the two Islanders discover more about the new world than they ever bargained for. 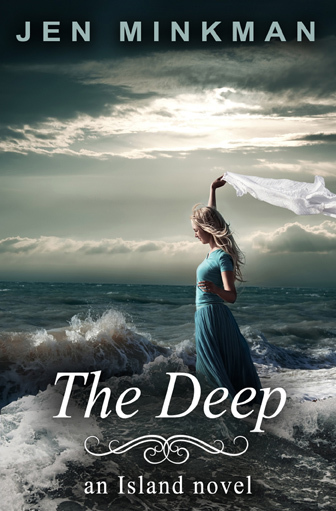 The Deep is the third and final installment in the Island series. The entire series is selling well on Amazon, Barnes & Noble and other platforms, selling an average of 300 books a month in English. Books 1 and 2 in the series are available in French. Other language editions of Book 1 (The Island) are available in German, Spanish, Portuguese, Italian, and Afrikaans. A Russian edition is in the works. I never realized just how much space there is – how far and wide the water around our island stretches out. Somewhere in the back of my mind, I may have believed that a second Wall ran around Tresco, containing the infinite waters so we wouldn’t all wash over the edge and plummet down into the deep. But that Wall isn’t there. We sail on, and on, day and night, and there are no boundaries keeping us in, no border to stop us from going on. Nor is there a deep abyss to swallow us up. There is just the horizon, ever coming closer and yet remaining unchanged. And at night, there are bright, twinkling stars that never seem to move despite the Explorer’s ongoing journey. “Yeah, I can be romantic.” Walt pulls me in for a hug.